The captivating appearance of this image of the starburst galaxy NGC 1313, taken with the FORS instrument at ESO's Very Large Telescope, belies its inner turmoil. The dense clustering of bright stars and gas in its arms, a sign of an ongoing boom of star births, shows a mere glimpse of the rough times it has seen. Probing ever deeper into the heart of the galaxy, astronomers have revealed many enigmas that continue to defy our understanding. The galaxy bears some resemblance to some of the Milky Way's closest neighbours, the Magellanic Clouds. 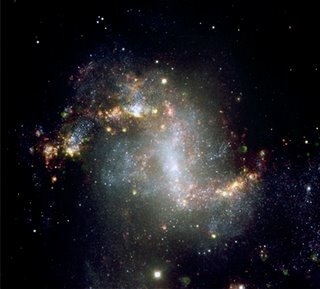 NGC 1313 has a barred spiral shape, with the arms emanating outwards in a loose twist from the ends of the bar. The galaxy lies just 15 million light-years away from the Milky Way - a mere skip on cosmological scales. The spiral arms are a hotbed of star-forming activity, with numerous young clusters of hot stars being born continuously at a staggering rate out of the dense clouds of gas and dust. Their light blasts through the surrounding gas, creating an intricately beautiful pattern of light and dark nebulosity. Starburst galaxies are fascinating objects to study in their own right; in neighbouring galaxies, around one quarter of all massive stars are born in these powerful engines, at rates up to a thousand times higher than in our own Milky Way Galaxy. In the majority of starbursts the upsurge in star's births is triggered when two galaxies merge, or come too close to each other. The mutual attraction between the galaxies causes immense turmoil in the gas and dust, causing the sudden 'burst' in star formation. 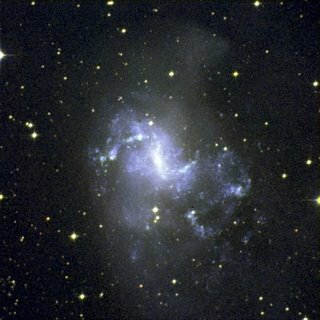 Strangely enough NGC 1313 seems to be an isolated galaxy. It is not part of a group and has no neighbour, and it is not clear whether it may have swallowed a small companion in its past. So what caused its asymmetry and stellar baby boom? An explanation based on the presence of the central bar also does not hold for NGC 1313: the majority of its star formation is actually taking place not in its bar but in dense gassy regions scattered around the arms. By what mechanism the gas is compressed for stars to form at this staggering rate, astronomers simply aren't sure. In the midst of the cosmic violence of the starburst regions lie two objects that emit large amounts of highly energetic X-rays - so-called ultra-luminous X-ray sources (ULX). Astronomers suspect that they might be black holes with masses of perhaps a few hundred times the mass of our Sun each, that formed as part of a binary star system. How such objects are created out of ordinary stars cannot be conclusively explained by current models.